Cultural activities offered daily throughout the campus for greater language immersion ​. Is one of the oldest one in the country, stablished in 1997. Has an original textbook based on MCER levels: A1-A2-B1-B2​. Offers a wide range of free extracurricular activities per week. Publishes a Biannual online magazine to showcase our students written and visual work "CuéntELE". Offers a wide range of free extracurricular activities per week(tutoring sessions, auditing at undergraduate classes, local conversation partners, daily cultural on campus activities). Provides students with great free learning opportunities (tutoring sessions, auditing undergraduate classes, local conversation partners, and daily on-campus cultural activities). Located in a modern building on a vibrant campus with an excellent offering of spaces for varied activities: pool, library, bookstore, gym, sports fields, more than 15 restaurants,. and coffee shops. Great location: within walking distance of mayor shopping malls, supermarkets, parks, local housing, hotels and hostels. Plus: support in key aspects (student visa, homestay contacts). 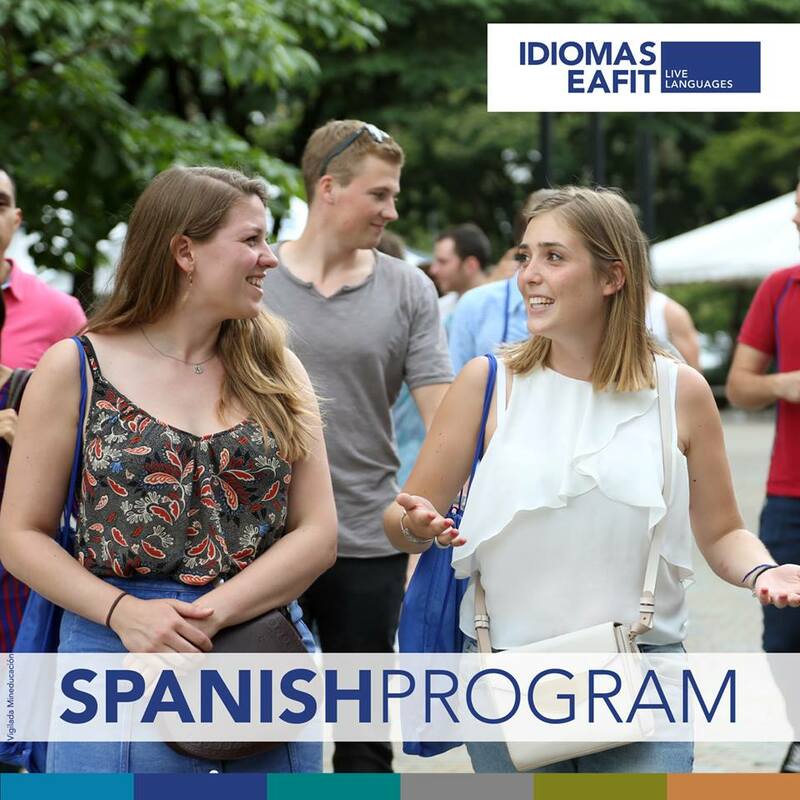 EAFIT is a fully accredited university and the Spanish program is certified by two internationally accredited organizations: Instituto Cervantes and ACCET. Provides student support in key areas, such as student visas and homestay contacts. I was part of the language exchange internship program, where I volunteered helping with a conversation program for students that were learning English. As part of this program, I received free Spanish lessons. The teachers were very knowledgeable, the facilities were always clean and organized. I think that EAFIT is a great place for anyone that wants to learn /improve their Spanish language abilities. After leaving my life in the USA in August 2016, I set out on an adventure to backpack Central and South America in hopes of seeking out volunteer opportunities, learning the Spanish language, and immersing myself in different cultures and communities. After arriving in Colombia in November 2017, I quickly soon after found myself in Medellin and learned about EAFIT University. I felt stagnant with my level of Spanish and knew that I needed a university setting that could offer more than local Spanish schools and was known for having seasoned educators. This led me to pay and enroll in 3 courses (B1 – 6, 7, & 8) to get a taste of the EAFIT experience. I could not have been more pleased with my decision. After completing the level B1 curriculum, I learned about the Scholarship to Share Language and Culture offered through the university. I knew that I wanted to serve the students in the university English programs and continue to improve my Spanish language acquisition. After going through the application and interview process, I was overjoyed to learn that I had been accepted into the program and would be living, teaching, and studying in Medellin for the remainder of the year (and also had the opportunity to extend the scholarship for an additional semester). I started in level B2 after obtaining the scholarship. I was lucky to have some phenomenal teachers during my student experience and saw my Spanish grammar and conversational skills improve. I had never truly understood how to correctly use the subjunctive tense before and as a result avoided using it in day-to-day communication. While acquiring any new language is a process and there is still more work to be done, I now understand the key words, phrases, and sentence structures that introduce the subjunctive tense. Additionally, I have seen myself grow more comfortable utilizing it in conversations and my writing. I have been fortunate to travel to some remote places in Colombia this year where one has to speak Spanish to communicate with the locals; I was impressed with how I was able to cope and effectively communicate in Spanish the entire time with those I met, resulting in a more enriched experience. I managed to complete all of level B2 (9, 10, & 11) as well as begin level C1 coursework (Advanced Grammar & Written Communication). I also have tried to take advantage of all the many offerings outside of the classroom provided by the Spanish program when time permits. I enjoyed how my classes took field trips and how I was able to schedule tutorials when needed too. I look forward to finishing the remaining courses offered during my time studying here. If you are thinking about beginning or continuing your Spanish language journey, EAFIT University is the place to do it!